Riftia pachyptila is commonly known as a giant tube worm. These worms can grow up to two and a half meters long, but several parts of their morphology have been highly modified or reduced to vestigial. Instead of a mouth and digestive system Riftia pachyptila relies on a symbiotic relationship with various microbes. The red tip is a feather-like structure called a plume. It is similar to some gills, except it is used to provide more than just Oxygen, it absorbs various dissolved gases which the microbes need to grow and reproduce. 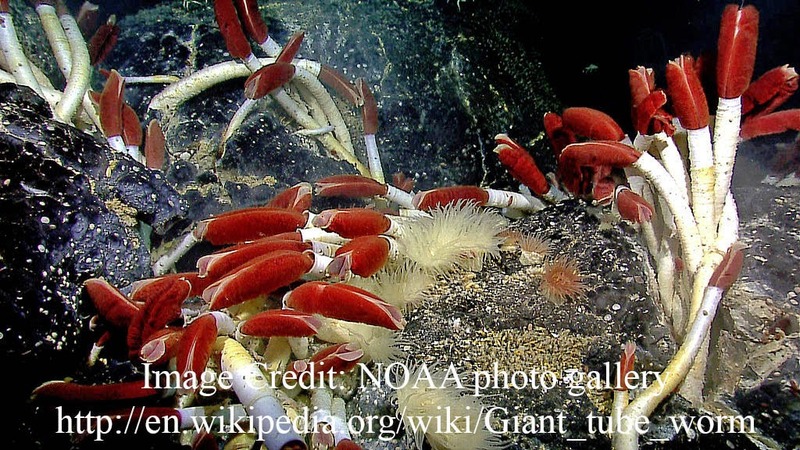 In return the microbes provide the nutrients which the giant tube worm needs to survive. 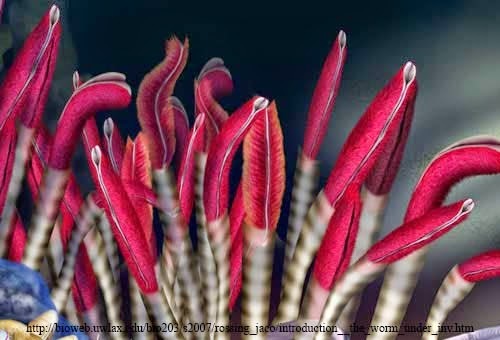 As a result of this the giant tube worm is highly tolerant to certain chemicals such as Hydrogen Sulfide, which its dependent bacteria can metabolize. The plume can be retracted back into a hardened tube for protection. Riftia pachyptila are found living near hydrothermal vents in the Pacific ocean. Riftia pachyptila is in the same phylum as Earthworms.